Think about your own needs and what it takes for you to feel comfortable in an environment. What makes you feel safe and secure? In truth, all living creatures have the same needs – food, water, and shelter – and if even one of those components is missing, they’ll never truly thrive in an area, if for no other reason than the fact that they can find what they need somewhere else. Whitetails are no different, which is why they prefer certain bedding areas or food sources over others. They simply feel safer and more secure in those areas than all of the rest. 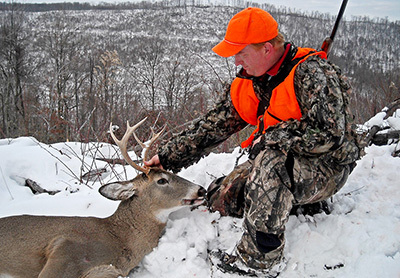 Making your land whitetail friendly is a multi-step process that involves much more than just planting food plots or fruit trees. I prefer to think of it as a whole combination of factors that all work together to make your property a deer hub. Over the next few issues of Pennsylvania Outdoor Journal, we will discuss how you can make your property THE place that whitetails prefer over all others – and it all starts with habitat. Let’s start by talking about timbering and why it’s such an important part of the management plan. Much of our National Forest Land in this state has reached full maturity. Huge portions of these lands haven’t been timbered since the early 1900s and decades of high deer populations have virtually destroyed the understory and potential for new growth. One of the major purposes of the current Deer Herd Reduction program was to restore some sort of balance between whitetail populations and their habitat. In theory, it’s a sound idea, and it would’ve been much more effective had certain parties followed through with their promises to increase logging on National Forest Lands. However, shortly after the DHR was implemented and antlerless deer harvests reached record numbers, timber prices dropped and logging ceased. We still have the huge forests but now we have far fewer deer. Walk through large portions of the Allegheny National Forest and it’s easy to see what’s going on. With so many tall trees and a dense canopy, not enough sunlight is reaching the ground to promote new growth. Even trees reach a point when they are passed their prime. An over-mature oak tree, for instance, will eventually stop producing acorns, or at least produce smaller yields. Timbering is an important part of any deer management program. 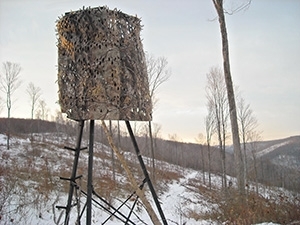 If you want to improve the quality of your land for whitetails, timbering has to play a role. How else will you create bedding areas where the deer feel safe and secure? How else will you provide the proper browse that will help them make it through the winter? How else will you ensure that your property will always have new stages of growth that will hold deer year round? The best properties have a mix of old and new growth forest. If you own 10 acres, for instance, I’d never suggest you have all 10 timbered during the same year. However, it wouldn’t hurt to cut three or four one year and then several years later cut another three or four. This layering effect creates edges and ensures quality habitat for years to come. Also remember that edges draw wildlife. Leaving little trails, small islands of trees, and other natural edges within the cuts is always a good idea. Selective cutting has grown in popularity in recent years. Essentially, selective cutting means only the biggest, most mature trees are removed from an area – the money trees, in other words, the ones that will provide the most product. Selective cutting can be great except that sometimes too many trees are left still standing and they quickly crowd out new growth. The best selective cuts leave lots of gaps to allow new trees the opportunity to take hold. Clear cutting has always been my favorite type of cutting. Over the years I’ve hunted numerous lands owned by paper companies in Pennsylvania and West Virginia and they were no doubt some of my most successful hunts. Granted, they were rough hunts. Many of those cuts were huge – 40-50 acres – and so thick as to be almost impenetrable. Many times I had to hunt the edges and wait out the deer because going in after them simply wasn’t an option. Those clear cuts and the edges surrounding them were the preferred bedding and feeding areas for deer, though. The goal of cutting is to promote new growth. The lush vegetation that appears in years one and two of newly cut areas are major deer magnets. By years four, five and six, grouse will start to appear and the cuts are now thick enough to provide sanctuary for whitetails. If you look back through Pennsylvania’s hunting history, the 1950s through 1970s are often viewed as a “golden age” for small game. The reason is two-fold. First, all of the logging prior to 1950 created lots of great habitat. And second, many of the old farms of the 1930s and 1940s were abandoned and left to nature. Those old orchards and pastures became prime habitat for rabbits, grouse, woodcock, and eventually whitetails. The only problem, of course, is that logging practices started changing throughout the state and stopped occurring as frequently. Forests matured. There was no new growth to take its place. Many of those farms also grew up into big woods and that cycle ended as well. Is it any wonder that over-browsing became an issue? Bait will help you catch the the fish you want — the most, the biggest and the nastiest lunkers around! Baitfisherman.com is the secret of fishermen who use bait. Our site is devoted to solid, how-to-do information which will help you catch the long stringers of bigger fish. It gets you away from the gadgets and into proven, fish-catching methods that work in hard-hit waters! We covers all species of fish and all bait methods. Bookmark us for constant contact and increase your fishing results immediately! Get the Latest in Fishing, Hunting and Trapping Publications! RichFaler.com helps you connect with projects Rich Faler is participating in. This includes the American Trapper, PA Outdoor Journal. BaitFisherman.com, and various books and DVDs – as well as Rich's blog.